My last post gave an overview of how the ADIPs testing scheme works for amusement devices. 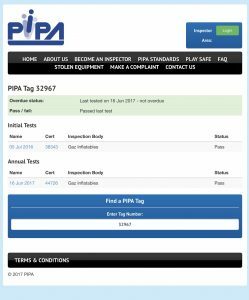 However, there is a similar testing scheme for the inflatable play industry called PiPA. Inflatables Slides, Bouncy Castles ect can be tested by ADIPs testers, but PiPA testers specialize in just inflatables, with many of the testers being manufactures of play equipment. 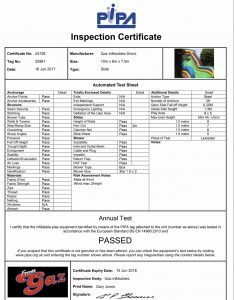 Is an inspection scheme set up by the inflatable play industry to ensure that children’s inflatable play equipment conforms to recognised standards. It is coordinated by The Performance Textiles Association (trading as MUTA), the UK’s only Trade Association dedicated to marquees, tents and structures, whose members include manufacturers and operators of inflatable play equipment. The scheme is supported by the Health and Safety Executive (HSE) who were consulted at every stage of its development. While inflatable play equipment is normally a very safe and pleasurable way for children to exercise whilst having fun, poorly designed or badly worn equipment can increase the risk of injury to its users. Under the Health and Safety at Work etc Act 1974, manufacturers, hirers, operators and users have a responsibility to ensure minimum risk. Clearly that risk is much more easily managed if the equipment conforms to accepted standards and has been regularly tested. 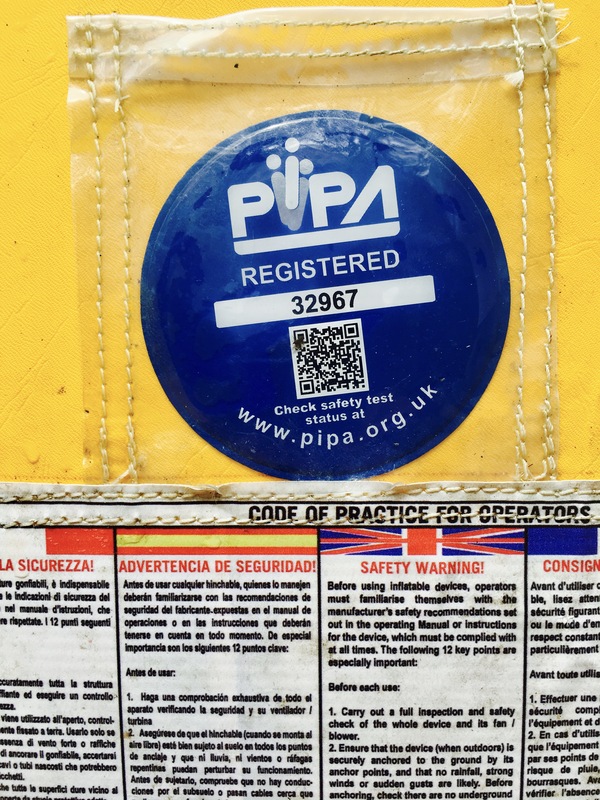 PIPA provides a means for everyone in the supply chain to know that the equipment itself is safe, both on initial use and thereafter. 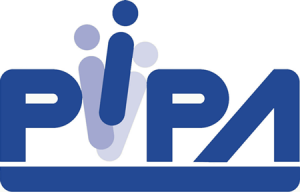 BS EN 14960:2013 is the European standard to which inflatable play equipment is tested through the PIPA scheme. British Standards are not strictly defined by the UK law but following them is regarded as “best practice” and would usually be sufficient to demonstrate compliance with the Health & Safety at Work Act 1974. 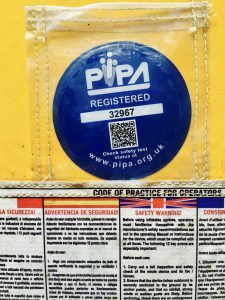 Each piece of conforming equipment supplied by a reputable manufacturer or importer is “tagged” with a unique number which is attached to the inflatable throughout its life. The tag number is logged on a central database where the results of its initial test and subsequent annual tests are recorded. In addition a certificate is issued with each test. 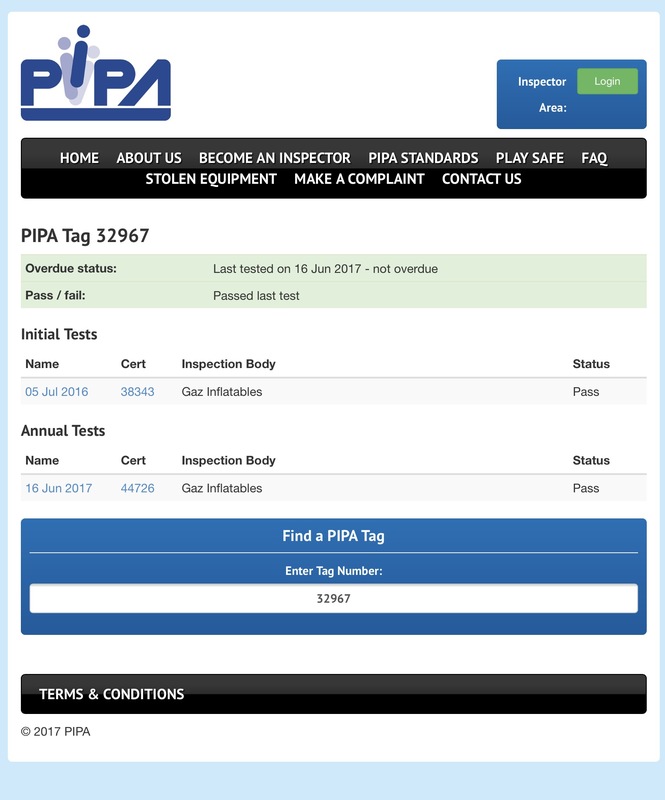 HSE & Event organizers have access to the PIPA database via the Internet www.pipa.org.uk and can therefore check on the inspection status of any tagged equipment. A month before our inflatable slide test was due to expire, we made arrangements to take it back to the manufacture who made it for a re testing. Although it has only had light use, if it needed any repaires, these could be noted and then rectified at the same time. 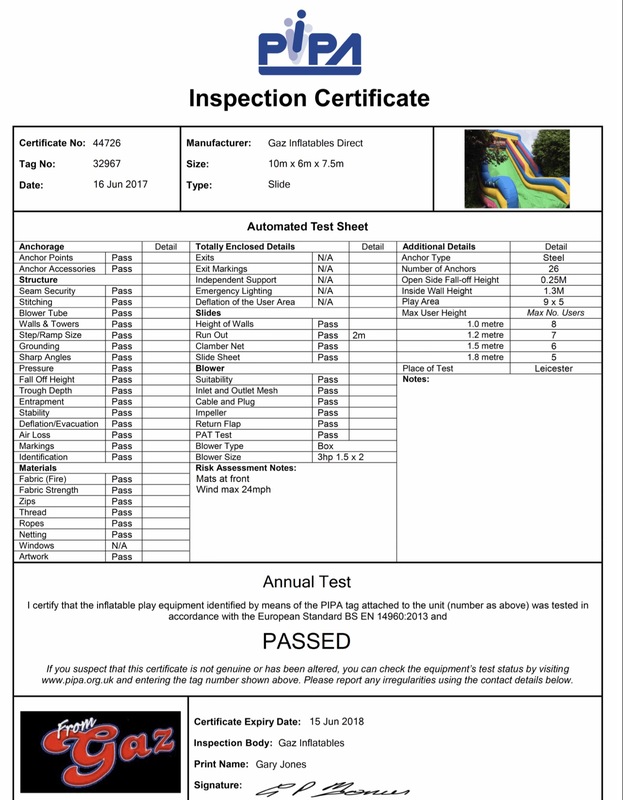 The pass certificate below shows what is inspected by the tester. Posted by William Danter on 9 August 2017.